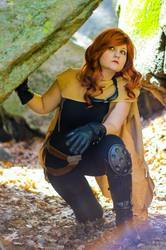 Myratheon Cosplay is a professional armor maker, photographer, and Star Wars fanatic from Lil Rhody! Cosplaying since 2013, she's already accumulated multiple Best in Shows for her craftsmanship, created multiple screen accurate costumes, and even started a business doing cosplay commissions for a living! She loves answering questions for new and experienced cosplayers, sharing tips and tricks to make costume construction more efficient. When she's not commissioning, she can be found doing events with the 501st Legion, hiking in the woods, or pursuing her endeavors as an amateur chef!